More defensive injuries are why Arsenal lost to Man United? With Arsenal’s excellent home record, we had high hopes of stopping Man United’s winning run last night, especially as we started with quite a strong defensive line-up with Sokratis and Koscielny in the middle and Maitland-Niles and Kolasinac on the flanks. But as usual, disaster struck after just twenty minutes when Sokratis landed awkwardly after an aerial dual with Jesse Lingard and was forced off and replaced by Mustafi. Then in the second half our captain Koscielny, who has only just returned to full fitness, went down clutching his face following an accidental collision with Manchester United striker Romelu Lukaku. He was immediately sent to hospital with a suspected broken jaw which is more bad news for Emery’s defensive options. The boss thinks that these two incidents had a big effect on last night’s result. ‘I think they weren’t big injuries for Sokratis,’ Emery said in the Mail. ‘Maybe Laurent Koscielny is going to hospital to [analyse] what injury he has. Maybe he’s broken his jaw but I hope not. ‘I’m happy because I think our work is good, but the result is bad. Today it’s the result and the injuries. ‘They don’t help us to be in the match, maybe when the result’s 1-2. In this moment we had the possibility to grow and to win, but these injuries – especially the one to Koscielny – didn’t help us because our rhythm went down. ‘Also, we needed to change different players to play at centre-back. ‘They were very clinical today and in the moments when we attacked, we got into the box but couldn’t produce the last action to score. We really could do without any more disruption to our back line, especially with the Man City game coming up next Sunday, but hopefully Kos and Sokratis can recover quickly, and I am hoping to see Mavropanos begin his comeback from injury against Cardiff on Tuesday. Oh how much different our season could have been without these incessant injuries! This entry was posted in Arsenal game review, Arsenal Injury News, Arsenal News, Arsenal NewsNow on January 26, 2019 by Admin. We lost because they have world class players and we have average players simple. We need to get used to the fact that we arsenal fans will continue suffering for a sometime. Fanbase will be better without fake fans like you. I can just picture it now…. the future Newcastle (no disprespect to any Newcastle fans). If your happy with a team that were champions but now just mediocre players then that’s your choice. I will follow Arsenal but will make sure I never spend a penny on them to make the people behind the scenes rich and myself poor. We need to sign 2 players this January. Gary Cahill and one of Isco or Asensio. Make a loan move for either of them. Re integrate Ozil back into the starting Eleven. Do you really think Isco is available for loan? When there are teams who happily pay big money for him? Arsenal have truly hit rock bottom. I think there are reasons for the only loans thing. We have little money for this window, but are keeping it for the summer because this window the players are too expensive and your options are less. That, and the fact that every-time Arsenal go for good players the team we deal with do give us a price as if the player was already close to being world class. The only way to put a stop to that is to act in a similar way to how we are now, only saying we can loan, not being able to accommodate Ramsey, and are feeling the pinch of Ozil, Mkhit, Auba, Laca, Kol, salaries. Unless it’s all true and then we really seriously are in trouble. We wouldn’t lose Sven though surely, if the no money part is completely true. They are a liability when they are fit so why not give an opportunity for younger players? To be honest I am losing interest rapidly – how can you get behind a group of players you know are going to fail every time. I long for the good old days where you used to look forward to the games. When we had Wenger and Vieira, Pires, Bergkamp and Henry. Who gets excited by this bunch of players? Its just going through the motions…. Leon, keep on bagging Emery with no positive contribution, sooner or later you might believe it. If you had followed Arsenal as long as other on this site, you would know that Arsenal has had many seasons far worse than this. Ivan Gazidis promised that leaving Highbury for the Emirates would lead to Arsenal challenging the best sides in Europe, let alone in the EPL. Where has the money gone? You and I can agree on one thing, I too would like to see Emery put some faith in Arsenal’s youth. I think the defenders getting injured didn’t help. Cech was seriously poor though, for the second and third goals he was just poor, he should have done better on second goal, GK should not be beaten by that shot. The last one how he just knocks it straight into play, again it was so poor. I never liked switching between GK’s and you want as few changes to backline as possible. Utd were clinical like Emery says but that is being kind. We didn’t tackle this game with near the same intensity as the Che, I have to ask myself how much did Emery really want to win this one. He wanted to win, but not as much as the Che game. Tactics and energy, the pressing, the mood leading up to it with them paint-balling and pictures of training sessions. He picked a strong team, but I just felt that we had players holding back until the second goal, then at 1 – 2 I felt some were holding back some energy while others were running themselves into the ground. It’s a hard loss to take because utd are gaining confidence by the minute, but the other two comps are the priority and I believe we have not got the squad to also keep going in the cup. What is more worrying is that we know lack creatives in the midfield and only seem to have iwobi who looks capable of trying to beat his man and move forward with the ball. Ramsey seems to have found some form just in time to go to Italy. It was evident last night that we found it extremely hard to break down man Utd two banks of 4 and play through the lines. Ozil looked lost again yesterday and doesn’t seem to have the ability to fitght or press the ball. The owner needs to put his hand in his pocket to see if emery and the back office team can secure a winger who can go past players and someone creative In midfield who has the ability and will to close down players, press without the ball and put a tackle in. Looking thread bear at the back at the moment as well. The Europa cup and a top 4 finish would be an absolute result if we could achieve either. After the way Wright(and Shearer) traduced us on TV last night and ignored the severity of our crucial match changing injuries, I would be ashamed today to be his brother, as you claim to be. The simple truth is that we have been majorly unlucky with defensive long term injuries which have killed our hopes this season. It is dishonest to ignore this, or virtually so, as Wright did. I may be almost alone in seeing the clear truth about how much these constant injuries to key players have damaged us. As Gooners, it is the clear duty of US ALL , to stand up for our team who gave their utmost last night. But sheer bad luck killed us. THAT IS THE PLAIN TRUTH! Spurs lost a match and was referred to as injury ravaged, just because of Kane. Yet nobody acknowledges the number of injuries we have for key players. Part of the reason why arsenal usually have alarming injury stat is due to the lopsided officiating that wait for our players to be literally stabbed before a call is made. These analysts are annoying to listen to much of the time. jon fox, I agree with you on the diabolical disruption to the team due to injury, that Unai Emery has to deal with. Gily, there is such a double standard with regard to Arsenal and every other club; the injury issue relative to Spurs is just another example. Supposed fans on here slate Emery at every opportunity, yet Ponchitino with the best squad in recent Spurs history, despite having not won anything gets constant support from their supporters. Wenger left, Gazidi left, SVN left ………………… No funds for strengthening…………………. the future is bleak do doubt about it! Ha but my post was with a hint of sarcasm!!! So glad Emery FINALLY put the Ozil debate to bed yesterday, as he was proven right YET AGAIN! No need for any more Ozil articles hopefully. Well it looks like you’re going to have to do the same TMJW….and find someone else to slate! 😄 reckon that’s possible?! Again, if you ever read any of my comments, you’ll see I slate many others. It was only last week I said that I don’t want to see Xhaka starting anymore. Also it possible you could ever acknowledge that Ozil is poor? Will you ever comment on his poor displays, or just keep brushing it under the carpet? Hahaha! In all fairness though, it is mainly Ozil with you! Arsenal was dangerous but not clinical. They even became more dangerous and incisive when Ozil came on. People blame Ozil for the 3rd goal when actually it was the stupid, inaccurate, unnecessary back flip of Laca that eventually ended in the game over. Not to be ignored is the injury to Socratis which arguable changed the course of the game. You say we don’t have good players… But do we have good coaches? Good tactics? Good philosophy? Good attitude? An owner willing to invest long term? If not then we’ll be going through players rapidly, and on inflated contracts, leading to our eventual demise. Too many average players, and injuries have cost us dear. In regards to the starting XI: Laca, Auba, Holding, Bellerin, Torreira, Guendouzi, and possibly Leno, and Sokratis, are the only ones worth keeping. Kolasinac as well (but only as a wingback). The rest are just expensive deadwood. Except Iwobi… never forget that. He has been largely by far our best player down the flanks. Yes best player down the flank but unfortunately ends up passing it back, running into blind alleys or shooting well wide. I’ll give him 7 for trying but 3 for end product. I just meant out and out starters. Iwobi would be a decent squad player though. Arsenal was a tight bunch before Emery. And Emery is as stubborn as a mule. He chose to pick a fight with a star player who the team loves and adore. At the start of the season our boys showed Emery passion and guts and flair and all that Wenger had taught them trying to impress our new manager. I for one blame the manager because I sincerely think if a new manager comes in tomorrow morning our players can go 22 again to impress who ever it may be. Unai Emery is sinking at a rapid speed as I already see articles calling for him to be sacked. I only see posts from idiots like you. No ARTICLES AT ALL calling for Emerys head . Just you and your own madness! Show me proof of these so called fake and non existent articles before you post such lies again!! I will be only too glad to avoid even reading your daft posts from now on. One question though before I leave your posts for good: Are you even actually a Gooner? You don’t sound like one, though I doubt you even know that! And anyone who believes a single word published in that rag is not worth discussing with. Cheerio! So you are also daft enough to want Emery sacked then, I must assume from your post. Incredible stupidity ! 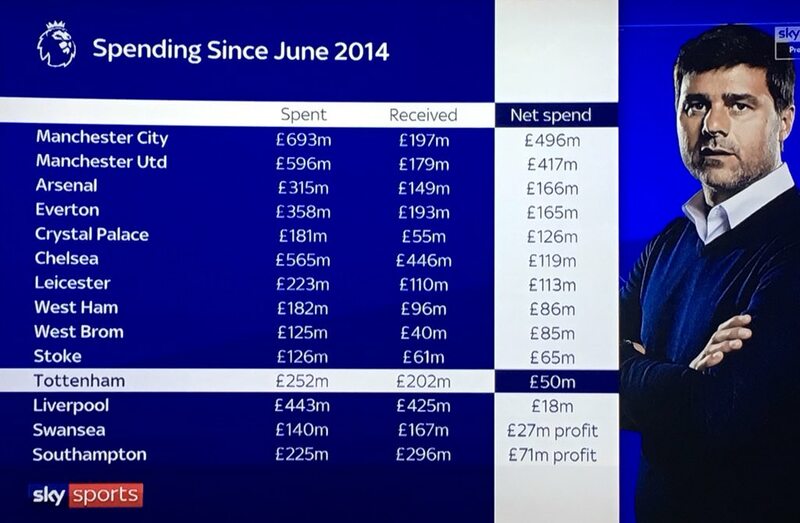 Arsenal have had money and Arsenal has spent money…Blaming Silent Stan when Arsenal have net spent the third most over the last 5 seasons… Almost sounds like giving the man credit. It is a shame we didn’t have a CEO who could get record fees for player sales, instead the CEO let contracts run down (player and business alike!) and we wasted many opportunities to recoup money to then spend. I put the loss down to tactics. Silly high line cost us again, against Chelsea we got numbers back to defend when we needed them, against UTD we was pushing and pushing and pushing…. Leaving a massive hole for them to exploit and they did, they hit us on the counter to good effect, that is how they won and Ole knew this with how UTD set up to play. We lost to Man Utd because we were devoid of creativity. Now that the figures show we made a record profit last year, and a particularly good profit through player sales are supporters going to voice ‘Kroenke out’. Please put ‘Kroenke out’ after every comment all the time. Arsenal are being used. Profits are stockpiled and not invested in the team. Not like they are the third highest net spending club in the EPL. I have been highlighting this for months now, Arsenal do spend, we just had a CEO who wasn’t worth his wage. A CEO who was hired to oversee a sale of a club and not development of a club. One could say I have done the big 7 EPL clubs and out of that, we have received the least income from sales, we have net spent the third highest. This imbalance means we can not spend spend spend like no tomorrow. Profit. Can you read?????? Bulb…Chandelier. As the the accounts for 17/18 are not in the public domain where did you get your PROFITS from. You are Mr Greedy Stan Kroenke’s mouthpiece aren’t you. Not my type of person. I could not care less about your me as a person. You have made a statement about Arsenals big profits when its obvious to most normal supporters reading this forum that there in fact there are not. The last available accounts show 27 million profit which is about what seems to be available for transfers in this widow. I am not a supporter of Kreonke but statements like yours will make some supporters think there is money available but there is not. What a tale of woe and hopelessness I am having to stomach on this thread from so many Gooner JEREMIAH’S( he was a harbinger of doom)! What on earth is the matter with your sense of perspective? Disappeared has it??? Are you unaware of the vast damage all these defensive injuries have done to our shape, to our reduced squad and to our hopes this season. Even Wrighty onTV last night almost ignored the severity of ALL the injuries and foolishly slated us. I saw a PLUCKY FIGHTING PERF WITH ALL PLAYERS GIVING THEIR UTMOST AND WAS AND REMAIN PROUD TO BE A GOONER TODAY. Though it seems I may be in a small minority right now with all the natural disappointment that has made SOME of you vastly overreact, BUT I do not forget the huge improvement in fight, grit, workrate and refusal to give in against teams that have endless money to spend, unlike us. I also do not forget how different this was only a year ago, under lax Wenger. NOR SHOULD YOU FORGET. Shame on you Wrighty; you have gone way down in my estimation , at least as a pundit. And Shearer said the same as Wright but what else would we expect. And like all sane Gooners, of course I crave Kroenkes exit asap, but until we force this creep out we have to suffer from his tragic ownership. COYG!!! My husband just said pretty much the same thing as you… He said we played well… had chances… the injuries killed us… they happened at the wrong time (not that anytime’s good but you know what I mean) Their GK had a good game… Ramsey was so unlucky not to have scored & he was brilliant… and that United just sat back waiting for the counter!! That is disappointing about Wrighty… never expect any different from Shearer!